“More cases of paralysis and one death yesterday,” Martha Potter wrote her daughter. It was summer 1935, and polio had broken out in Bowling Green. The reactions of Martha and other Kentuckians to this crippling and sometimes fatal disease are documented in the Manuscripts and Folklife Archives of WKU’s Department of Library Special Collections. Taking especially cruel aim at young children, polio or “infantile paralysis” brought fear to parents as it appeared in waves during the warm months. As a consequence, Martha urged her daughter not to bring her grandson from Louisville for a visit. Local children were being kept at home, she reported, and several new cases in a nearby community had prompted a quarantine. As July turned to August, “the paralysis breaks out every few days with one more case, just enough to make us uneasy,” Martha wrote, but she hoped that approaching cooler weather would diminish the threat. New summers brought new cases. “Our daughter Ruth had polio last August,” Ione Edwards wrote her Bowling Green cousin Ruth Robinson in 1947. Fortunately, treatment and exercise had left Ruth with only a limp. The virus, however, was not finished with Ione’s family; her granddaughter had lost the use of one arm to the virus, but she hoped that the four-year-old would prove as resilient as Ruth. 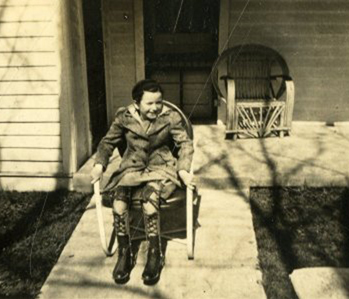 In 1944, “my paralysis began with the muscles of accommodation,” wrote Oakland, Kentucky native Marietta Mansfield. “I could not focus my eyes.” Then polio attacked her breathing and swallowing. A pastor and missionary, Mansfield wrote starkly of her hospitalization and struggle to regain movement. She recovered, but suffered from muscle weakness for the rest of her life. Click on the links to access finding aids for these collections. For other collections documenting Kentuckians’ battles with disease, search TopSCHOLAR and KenCat.